The highly rated Irish sprinter U S Navy Flag is ready to fly back on top of the ground in the 2018 Group 1 $1m Ladbrokes Manikato Stakes (1200m) at The Valley on Friday night. Sunlight, above, is the favourite for the 2018 Manikato Stakes at The Valley. Photo by Steve Hart. U S Navy Flag failed to handle the heavy Randwick track at his first run on Australian soil when ninth to Redzel in the $13m The Everest (1200m) at Randwick on October 13. The Aidan O’Brien trained speedster found it hard to get into stride on the rain affected track after being slow out of the starting gates but stable representative T J Comerford is expecting to see U S Navy Flag at his best back on a good track. “Slightly disappointing in The Everest but he didn’t get his ground,” Comerford said. “He’s definitely going to prefer this better ground, so hopefully he can put things right this Friday night. US Navy Flag has drawn well and you have to make use of your draw, too. “He probably has to pick up the pieces again, which I’m hoping he can do. U S Navy Flag is a three times Group 1 winner with his latest victory at the highest level was his all the way win in the £500,000 Darley July Cup (6 furlongs) at Newmarket in England on July 14. High profile English jockey Ryan Moore takes the ride on U S Navy Flag who has drawn perfectly at barrier two in the fourteen horse Manikato Stakes field. Ireland’s champion trainer Aidan O’Brien will have four runners in the Manikato Stakes and will also saddle up Spirit Of Valor (Oisin Murphy, barrier 14), Intelligence Cross (Emmet McNamara, barrier 5) and Fleet Review (Kerrin McEvoy, barrier 11). 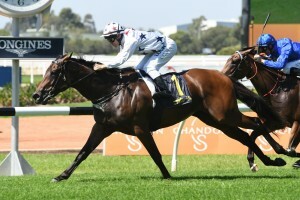 Ladbrokes.com.au have U S Navy Flag marked as the Manikato Stakes market mover after firming in from $9 to $7 while the Tony McEvoy trained filly Sunlight at $4.60 holds a slight advantage at the top of the betting over the James Cummings trained Kementari at $5.